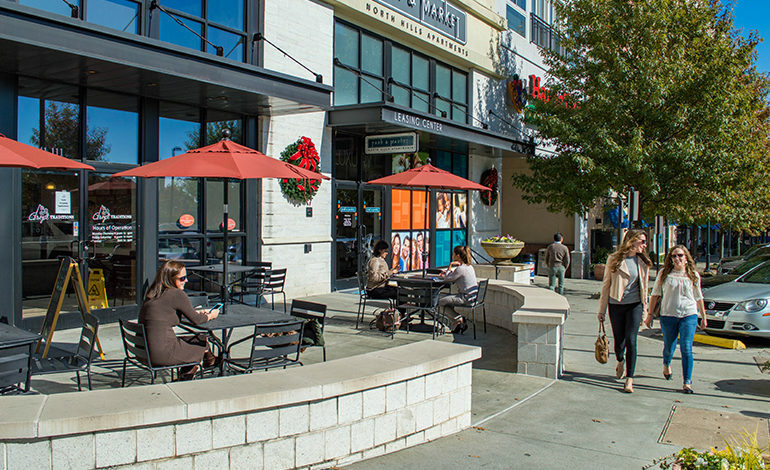 One of Raleigh, NC’s fastest growing and innovative re-development projects, North Hills East, is a dynamic mixed-use project of unparalleled scale in the Triangle with a pedestrian-oriented design and easy access back to the highly successful North Hills project (also a project of McAdams). Due to its location and to the nature of any urban redevelopment endeavor, this project presented numerous challenges. With experience on similar large, urban mixed-use projects, McAdams navigated through the very deliberate Planned Development District rezoning, securing the greatest flexibility for this project. Securing the rezoning allowed for a reduction in setbacks, increased allowable building heights, reduced building separations, modified tree conservation areas and reduced buffer yard requirements. In addition, the team was successful in securing the necessary Land Use Plan amendment required while assisting the Developer with neighborhood and Citizen’s Advisory Council (CAC) meetings in order to secure complete support by the neighbors and unanimous approval by the CAC. Our team negotiated the necessary wetland impact permits with special mitigation, including the implementation of limited use of pervious pavement and underground stormwater treatment design. We also secured credit for existing impervious surface, minimizing the stormwater management requirements and reducing costs for treatment.